India is, without a doubt, one of the marvels of the 21st century from an economic standpoint, especially when viewed in the context of where it was just a century ago. In 1917, India was still part of the British Empire, same as Canada. For hundreds of years, India had been under British control, and had served as the crown jewel for the Eastern portion of the Empire in many ways, a great many of which did not, in turn, benefit the local Indians all that much. Even following the incredible success of the immortal Mahatma Gandhi’s revolutionary non-violent form of protest which in turn let to, well, a revolution, there were doubts about whether or not a nation with such a massive population and internal strife could even feed itself, let alone compete. And here we are, in 2018, when the question isn’t if India can compete with Canada, the US, the UK, and the rest of the West, but, indeed, how those nations can keep up with the massive manufacturing boom that’s occurring in India. To be clear, not all the manufacturing jobs in the region benefit the overall economy rather than Western interests, but that’s a story for another day. Today, we’re focusing on what happens after just about any nation undergoes the sort of radical transformation India has in the last century—immigration and emigration. The forces of change have led many to leave India as foreign businesses have arrived. So, what are the best locations for Indian nationals looking to immigrate to Canada? Let’s take a look. First of all, it should be noted that even the term “Indian-Canadian” is something of a misnomer. India is such a huge and vast subcontinent and country that there are a litany of different ethnicities, languages, cultures, religions and traditions within that overarching umbrella term of “Indian.” That being said, the Canadian government largely tags these groups as all being “Indian-Canadian,” and in any case, no matter what Indian culture you belong to, you’re sure to find a community waiting for you in Toronto. 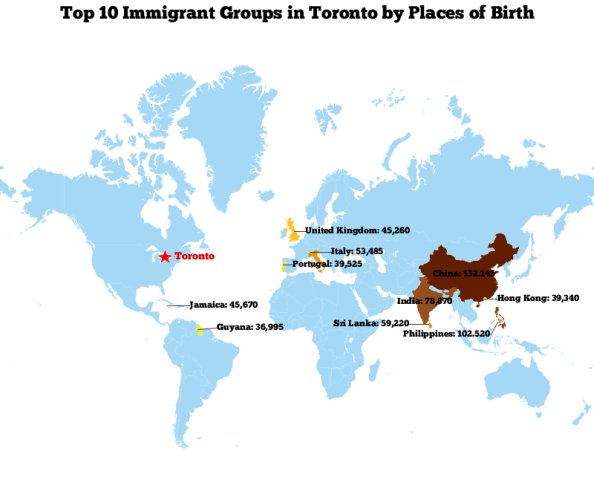 One of the most immigrant-friendly cities in North America, more than half of the entire Indian-Canadian population resides in Toronto. It is home to a wide variety of different Indian cultures, meaning that you have a good chance of finding fellow Indian nationals who more closely fit your own linguistic, cultural, and religious background, rather than merely immigrating somewhere with the semi-helpful moniker of “Indian-Canadian” to guide you. As English-speaking Canada’s most world-renowned city, Toronto is home to not just the majority of the nation’s Indian-Canadian population—and all the subcultures therein—but likewise has some of the largest and most important Indian structures in the nation. The BAPS Shri Swaminarayan Mandir in Toronto is the nation’s largest Hindu Temple, while the Ontario Khalsa Darbar is Canada's largest Sikh gurdwara. Vancouver is one of the most popular North American immigration locales, period. This is especially true of individuals looking to immigrate to the Pacific Northwest, Canada, or both. Vancouver is home to a large Punjabi and Sikh minority. This is notable, as the latter in particular has had difficulty assimilating into American and Canadian society. Hindus are also welcome in Vancouver. Festivals, temples, and large-scale public celebrations of all different forms of Indian heritage and culture are present in the crown jewel of British Columbia. The nearby town of Abbotsford is home to the Gur Sikh Temple. Constructed in 1911, it is the oldest Sikh temple in North America. One of the many reasons the Pacific Northwest has sprung to life over the past few decades has been its booming computer and tech industries, both of which are likewise huge in India as well. As such, if you’re looking to immigrate to the Pacific Northwest for business opportunities in these fields but do not wish to move to a larger city such as Vancouver or Seattle in the United States, you may want to try Surrey, a smaller but Indian-friendly locale also located in British Columbia. Surrey is especially welcoming to Indian Sikhs, with as much as 16.3% of the population reporting as such, an impressive number anywhere in North America, especially in the Great White North. April 13th is given over to the celebration of Vaisakhi, an important festival for both Sikhs and the Punjab region of India as a whole, and one which historically commemorates the start of the harvest while carrying strong religious undertones for those of practising Sikhism. In 2008, as many as 100,000 attended. As such, if you’re a Sikh looking to immigrate to the Pacific Northwest for a fresh start or to take advantage of the booming tech sector, Surrey may prove to be a terrific fit. Around or more than 5% of the entire Indian-Canadian community reside in the city of Calgary. The city itself has been in the midst of some interesting economic times given its ties to the oil refinement industry. As noted above, immigration is often the result of individuals holding degrees or possessing training which they feel will yield more lucrative results elsewhere. As such, with Calgary so tied into the highly-important tech industry as it pertains to the usage and refinement of oil, Indians from across the subcontinent have likewise found their way there as well, working in the many sectors which have helped Calgary begin to recover from the 2008 Recession which hit so much of the world. Notably, Calgary is also home to a significant portion of Muslims. The relations between Sikhs, Hindus, and Muslims across India, Bangladesh and Pakistan is a long and problematic one, but thankfully members from all three groups have found a way to coexist in peace in Calgary. As such, if you happen to be a Muslim living in India and are looking for somewhere to pursue economic opportunities while not having to face the scrutiny many Muslims still face in larger Indian society today, then Calgary might be the right fit for you.